Monday Makings… Crochet Fun and Yarn Shopping! I love weekends!!! Lots of time to crochet and spend time doing my favorite things!! 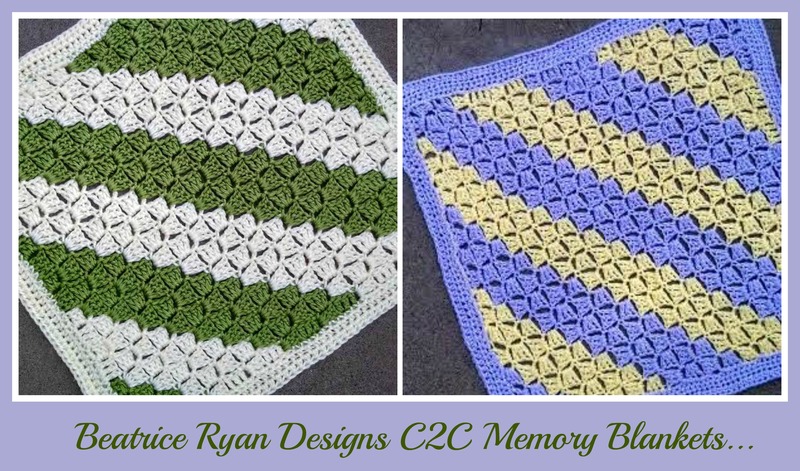 These Memory Blankets are a simple Corner to Corner Afghan and each measures approximately 15″. If you haven’t tried this type of afghan, they are all the rage and are easy to make… Red Heart Yarns has a great pattern you can follow… Click here for the details! This is the third time I have made this type of pattern and it is addicting!! Colors for my new project…. Now… What you have been waiting for… After much thought ~ My next Free Crochet Pattern will be the 8th pattern in my Amazing Grace Pattern Series!!! When I was trying to decide what to add, I realized I didn’t have a pattern for children yet! Since the Amazing Grace Series is dedicated to Cancer and Illness, our little loves need something to wrap up in when they are suffering and recovering!! 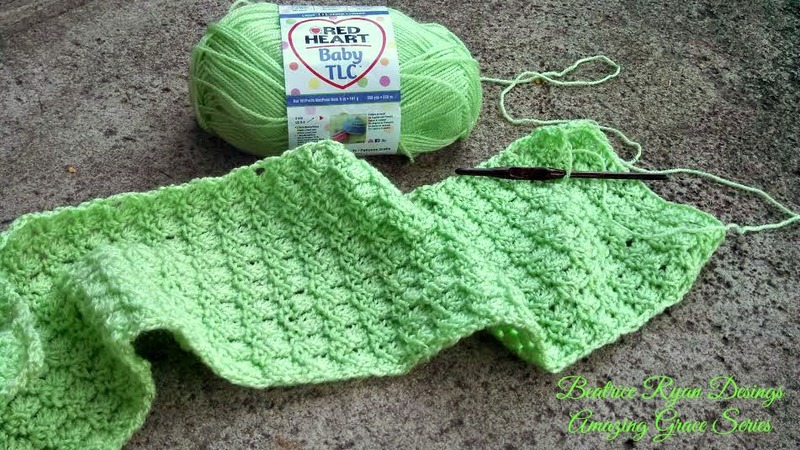 So… My next pattern is ~ Amazing Grace Baby Blanket… Here is a small sneak peek of this fun pattern… As usual we will be using the same stitch pattern that is in all the Amazing Grace projects… It is easy to follow and the finished afghan will be cheery!! Are you ready to make one?? The pattern is still in the works and should be finished before the end of the month!! Stay Turned!! 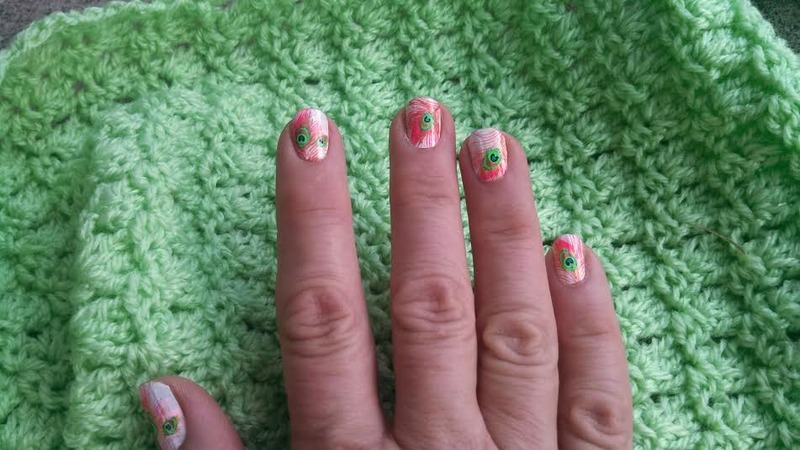 Also,,, Just for fun I did a quick manicure using these peacock fingernail stickers… Fun stuff!! 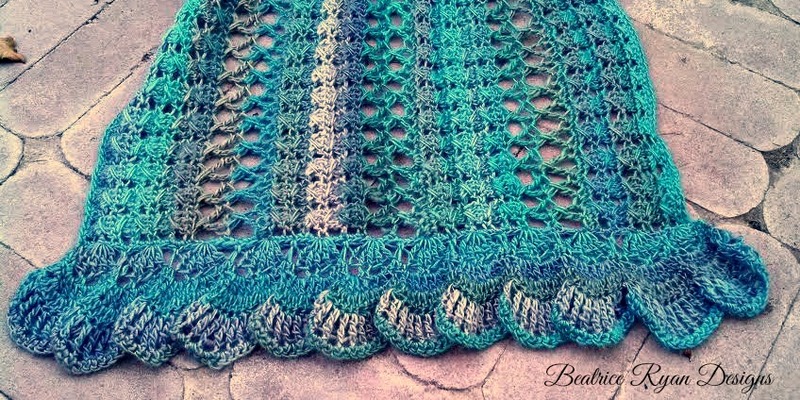 This beautiful shawl was inspired by cool summer nights in the mountains of Northern California…. And it would make a wonderful Prayer Shawl!! 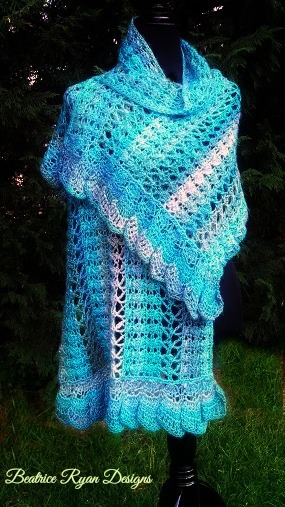 You can collect this pattern in your Ravelry Favorites and Queue too,, Click Here! Rows 3 – 6: Repeat row 2 four times. Row 7: Ch 4 (Counts as Trc now and Throughout), Turn, * Sk 3 Sts, Trc in next St, Ch 2, Trc in 1st Skipped St to form and X Stitch* (See Photo), Repeat * * Across, Trc in last St. = 47 X sts and 2 Trc. 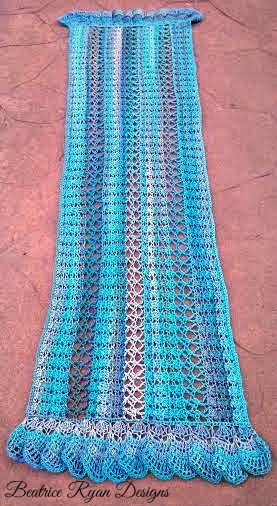 I recommend blocking your shawl for the best result. 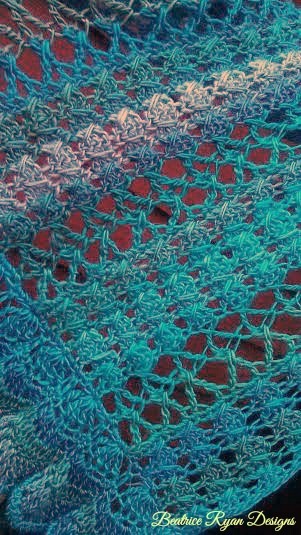 I used the Steam Blocking Method, but you may also dampen you shawl and pin it into place until dry. NOW … Also available in a video tutorial thanks to Bob Wilson 123!! 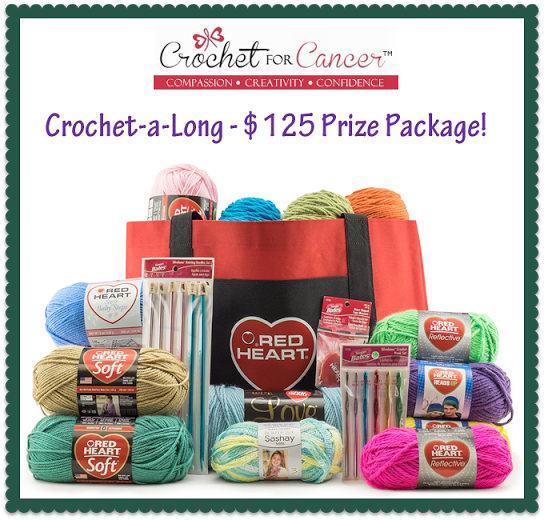 The Crochet For Cancer CAL and Giveaway Countdown…. 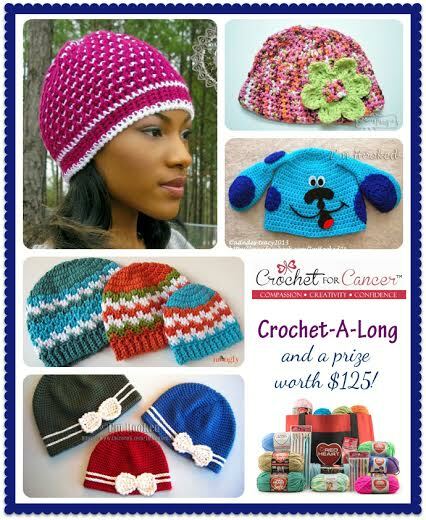 Are you considering joining in our amazing Charity Drive for Crochet for Cancer?? I hope you are!!! 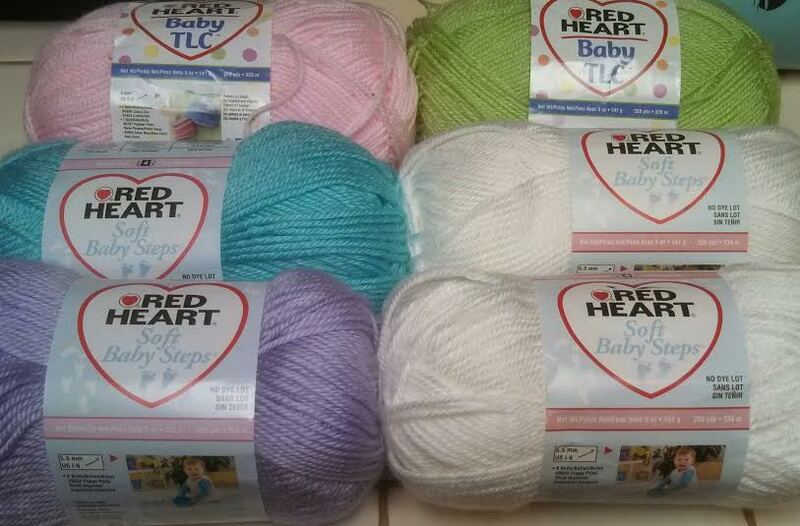 The countdown is almost finished… All packages must be postmarked no later than April 28th 2014 to be eligible for entry in the Red Heart Giveaway for the $125 Prize Package!! And, by supporting this Charity Drive,,, you will be helping those who are suffering or recovering from Cancer!!! 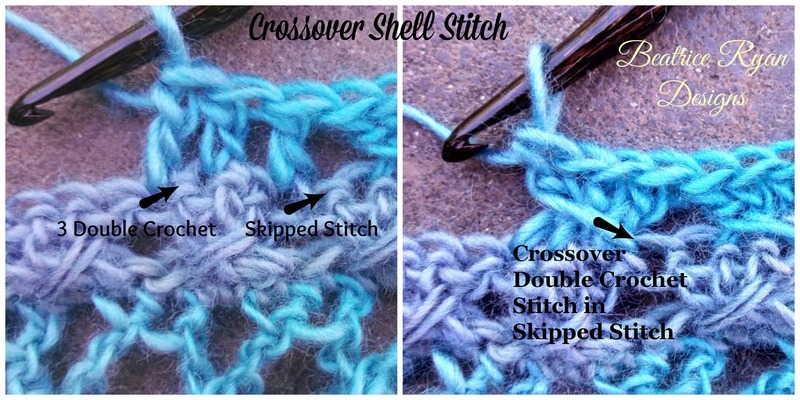 For more details on how you can get the Free Crochet Patterns, Get to know the Crochet Bloggers who have put this together, Giveaway Rules and much more… Click Here! 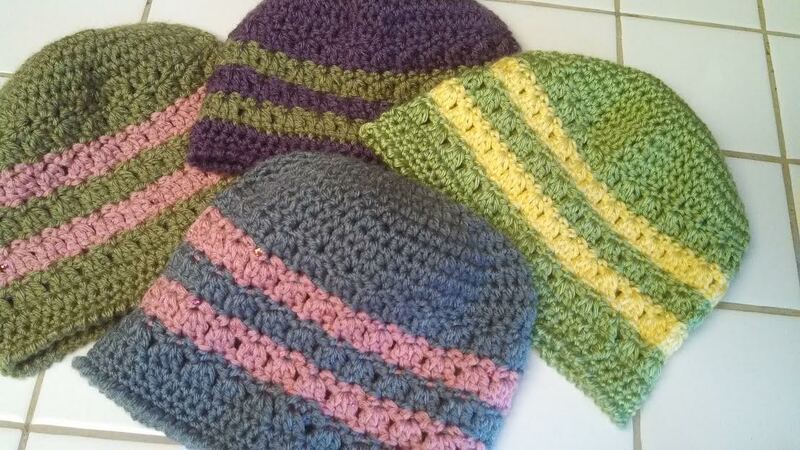 Here are 4 of the hats I mailed off…. 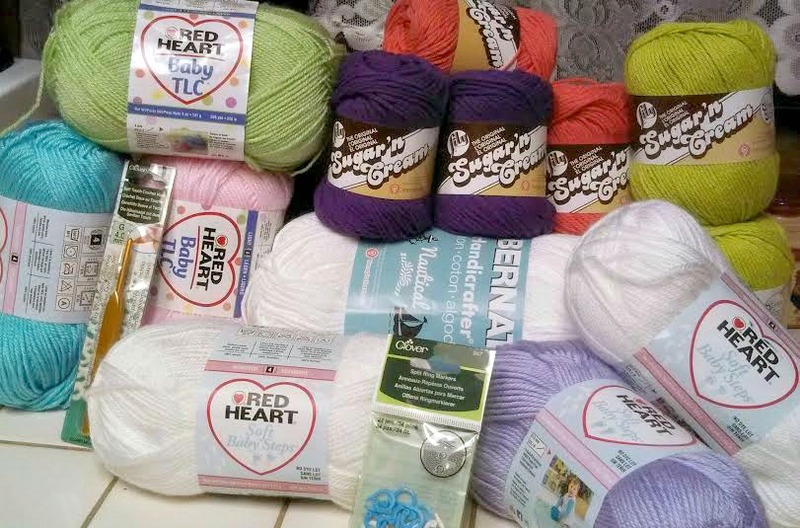 Crochet For Cancer CAL & Giveaway!!! 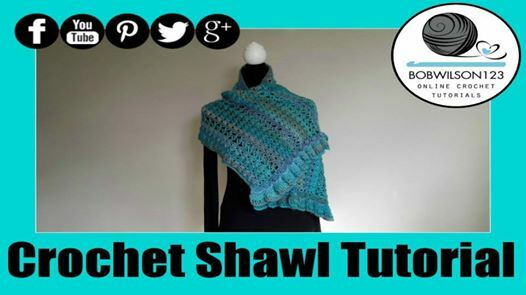 Lots of Free Crochet Patterns Available! !